(Bloomberg Opinion) -- The Federal Reserve miscalculated in December by believing that economists and markets agreed on the right monetary policy prescription. They did not agree, and when the Fed adopted the more hawkish view of economists — because the Fed is full of economists and naturally tend to agree with them — markets began pricing in a recession due to an impending policy mistake. As we now know, only when markets fell hard enough to get the Fed’s attention did policy makers understand their potential error and change course by adopting a more dovish view. One might think the Fed learned its lesson, but we fear that the likelihood of another miscalculation is high because economists and markets are still not in agreement on the path for policy. This chart shows various projections over time for the federal funds rate for year-end 2019. The green line shows the average of forecasts from 72 economists surveyed by Bloomberg. The red line is the implied yield from the December 2019 federal funds futures contract. The black line is the current target rate. The bottom panel shows how many hikes are priced in through the end of 2019. Currently, economists believe the Fed will hike 1.7 more times, as shown in the green bars. This rounds to two hikes and is largely in agreement with the Fed’s last “dot plot” chart from Dec. 19. Of the 72 economists offering a forecast, only two think the Fed will cut rates this year, while one thinks rates will be unchanged. The other 69 think the Fed will hike at least once, with 27 forecasting three or more hikes. The market has a vastly different view. It is pricing in no hikes for 2019, as shown by the red bars. Note that back in November economists were projecting four hikes though year-end 2019 (which included a December 2018 hike) while the market was projecting three. Now, however, the market thinks the rate hike cycle is over and economists think the December dot plot calling for two hikes this year is still in force. Why the difference? The next two charts show median GDP (first chart) and inflation (second chart) forecasts from these same 72 economists. They are forecasting a respectable 2.5 percent real rate of GDP growth for 2019 (green line), down from a 3 percent rate in the current quarter (blue line). Additionally, as the second chart shows, they are forecasting that 2019 core PCE inflation (blue line) ticks higher from last year (orange line) to be right on the Fed’s target rate of 2 percent. If these forecasts are accurate, economists’ outlook for two more rate hikes makes sense. 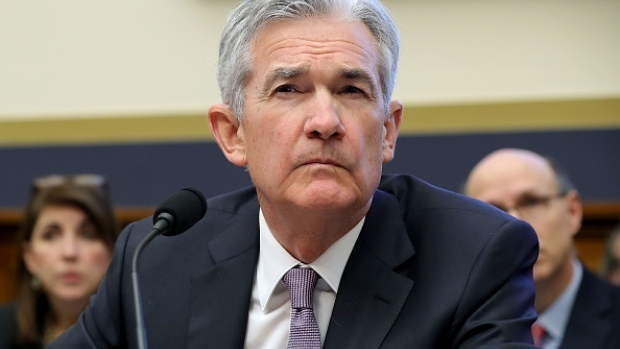 The markets, however, think the reduction in the Fed’s balance sheet assets by $50 billion a month is not like “watching paint dry,” as Fed Chairman Jerome Powell said in December, but instead is the equivalent of the two rate hikes economists are projecting. So no further action is necessary. A 2017 Kansas City Fed study on the effects of balance sheet normalization shows why the Fed thinks its balance sheet reductions are no big deal. The study concluded that a $675 billion reduction in the balance sheet was roughly equal to a 25 basis-point rate hike. The Fed has reduced its balance sheet assets by $413 billion since October 2017 to $4.02 trillion, the equivalent of two-thirds of one rate hike. The Fed projects another $550 billion in reductions over the next 11 months. Maybe the Fed think that’s no big deal, but that’s not how the market thinks. Last week, CNBC released its latest Fed survey in which respondents were asked what a $600 billion reduction in the central bank’s balance sheet would equate to in terms of rate increases. The response was an average 41.6 basis points, or almost two full 25 basis-point rate increases. The next chart is an example of the liquidity squeeze the comes from the reduction in the Fed’s balance sheet, with the overnight repo rate (blue) and interest on excess reserves rate (black) in the top panel. The bottom panel shows that the overnight repo rate has moved from a discount to the IOER (red bars) to a premium (green bars) as the Fed reduced its balance sheet. Former Fed Chairman Ben S. Bernanke said last month that “Expansions don’t die of old age. I’d like to say they get murdered.” The leading murderer of the economy is the Fed, which tends to tighten monetary policy too much under the guise that inflation is coming back. You often hear economists say that there’s no chance of a recession because employment is fine or GDP is doing well. Sticking with Bernanke’s metaphor, this is analyzing the victim and not looking for the potential killer. By failing to understand the market’s view of balance-sheet reduction, the Fed erred in December by coming off as too hawkish. Markets plunged as they thought the Fed would murder the economy and began to price in a recession. Powell reversed himself with his “patient and flexible” speech on Jan. 4, and markets rallied. But now we’re back to the same position as early December. Economists think economy needs several rate hikes and a massive balance sheet reduction. Markets think it needs much less. For now, the Fed says things that sound like it agrees with economists, like Powell arguing earlier this week that the probability of a recession is not elevated. At the same time, the Fed is implementing a far more dovish policy, closer to what markets believe is appropriate. Incidentally, does Powell understand that recession risks are elevated because the Fed elevated them? As long as the disagreement between economists and the markets exists, the risk is that the organization full of economists — the Fed — will again gravitate toward a too hawkish stance for markets, creating problems down the road. The ultimate fix would be economists and the markets getting back on the same page. For now, they are not.